I have been waiting for this day for so long! The newest WPlus9 Release is available in the store and it's freaking glorious! Can you tell I'm in love with these products?! The cute sets are adorable and the flowers are incredible. I can't wait to use it all but I made a bee line for those hibiscus. I wanted something really bright and colorful so I decided to do a pit of watercoloring with my Distress Oxides. Once that was dry I went in with my Copics to add a bit of shading. I actually kept the shading to a minimum. Crazy right? I added one color to each leaf or flower and then used a gray to put in a slight shadow. That just helped to create a separation between the images and the background. With the sentiment I originally stamped it but it was a no go. Approach number two was a bit of heat embossing. 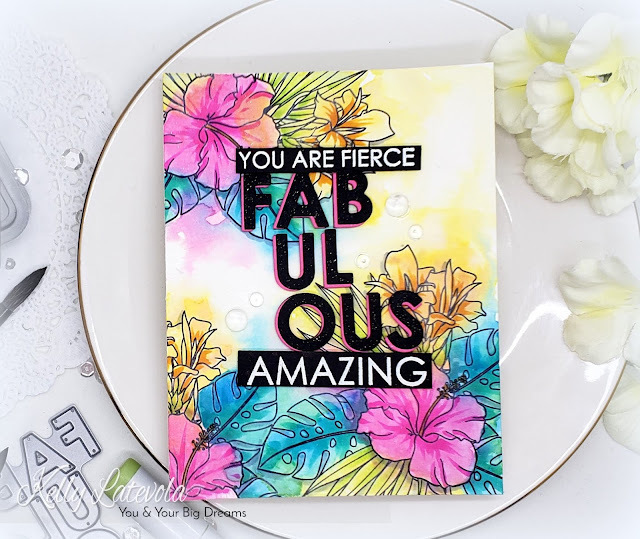 I tried the fabulous die with hot pink paper originally but I didn't love it. I ended up gluing a black die cut letter to the same one in pink just slightly off center. This creates a super fun drop shadow which I love!! You can watch the whole card come together while listening to me speak a mile a minute in the video below. Came over from YT. Oh, yeah. Really are pink letters :* Beautifully done. Hope you distress after the party! Love it! And I'm just like you house cleaning wise. Lol! Love your inspiration and for the real life stories ;) Blessings to you! Love the card - The shadow letters rock!!! "There appears to have been a struggle!!!! That made my whole night! I laughed and laughed...My kid thinks I am nuts when I listen to your videos with headphones. Laughing like a loon. Now she says, "oh, your watching a Kelly video?" LOL Keep doing what you do! You are not alone! You totally have described all 61 years of my life. But all three kids got raised and no one is in jail....and I still am 5 minutes behind where I need to be! 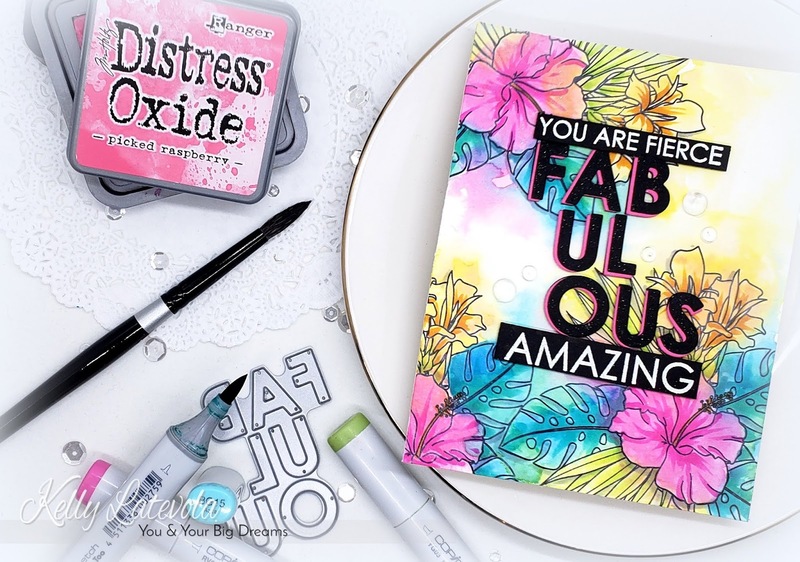 Love your videos and your cards! I'm right there with ya, sista! Always hurried and behind .Sounds like you need to call your mom!!! The card is beautiful. 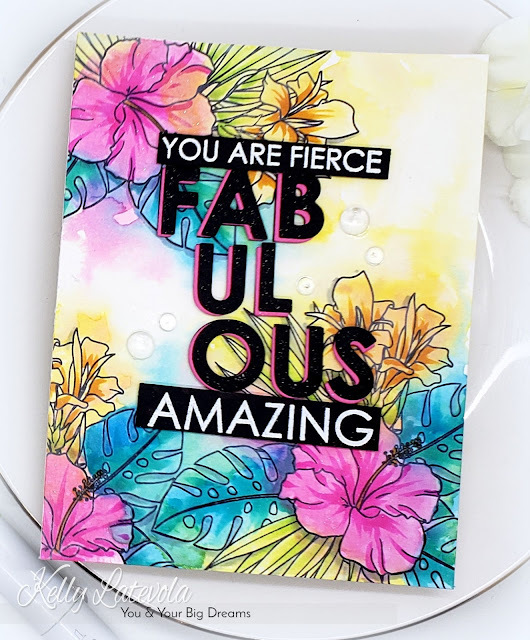 You're fierce, fabulous, amazing...And never forget it! Awesome, what a great card. I hope that I once have the guts to make something like that, loosely painting,a litle bit of colour here, a bit there. I still don't dare. 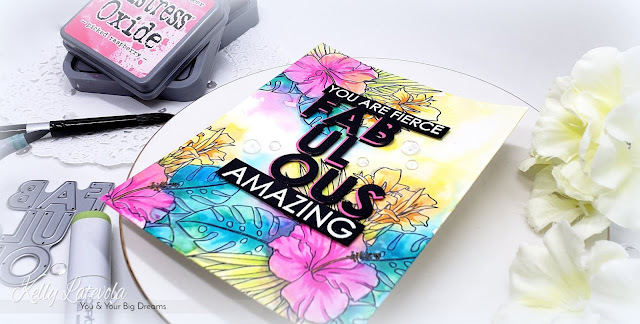 Love also the beautiful flower stamp from WPlus9. Thank you Kelly and I wish your son a happy birthdayparty! Hope your son had a great birthday and you got to relax and enjoy the time with family and friends. Happy birthday to your son.